Impact: Since 4.15.0-15 some machines have been failing to boot due to IO hangs. This is caused by patches applied for LP #1759723, which assigned managed interrupt vectors and reply queues for all possible CPUs, not just present CPUs. Some drivers were not prepared to cope with this and end up selecting reply queues not mapped to an online CPU, causing IO hangs during boot. Fix: There are driver fixes available upstream, but there are 8-ish patches in total and we're extremely close to release, so the safer bet it to just revert the patches for LP #1759723. We can consider reintroducing them with required fixes at a later time. Regression Potential: This is obviously going to reintroduce the problem the patches were intended to fix. These are less serious than the problems which the patches introduced, and IBM has given their okay to revert them as well. Test Case: Verified to fix affected hardware on LP #1765232. For Ubuntu 18.04 amd64 server, I updated the kernel from 4.15.0-13 to 4.15.0-15. The system hangs at boot up now. Rolling back to the old kernel everything works as expected. It appears to hang while trying to enumerate an SD card device, which isn't even installed. I have tried this on a Dell R620 and R820 and both have the exact same problem. I even downloaded a new installer iso from the daily builds to reinstall the OS and the installer hangs too now. Support for Dell PowerEdge 12th gen servers appears to be broken with kernel 4.15.0-15. To change the source package that this bug is filed about visit https://bugs.launchpad.net/ubuntu/+bug/1765232/+editstatus and add the package name in the text box next to the word Package. Re bot, the stated command can't be run because the system will not boot to a bash prompt. 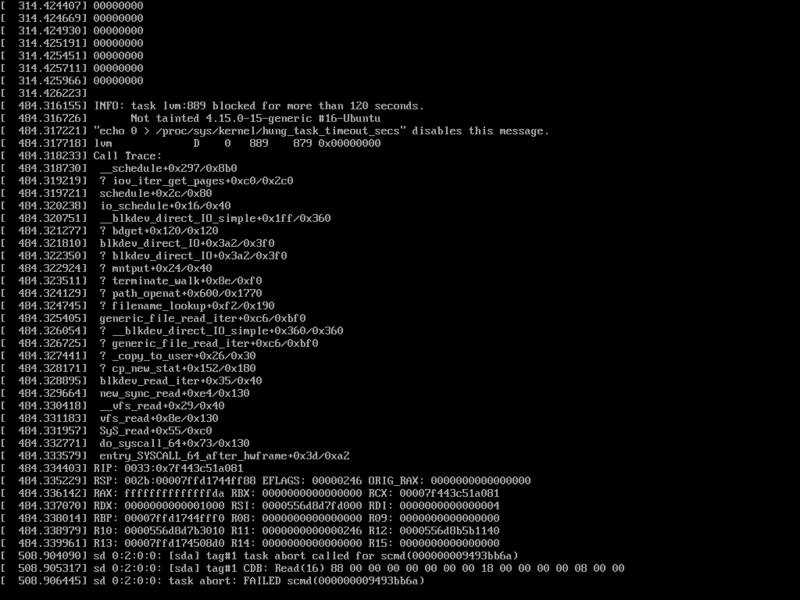 Would it be possible for you to test the proposed kernel and post back if it resolves this bug? See https://wiki.ubuntu.com/Testing/EnableProposed for documentation how to enable and use -proposed. If the bug still exists in proposed, we can perform a kernel bisect to identify the commit that introduced this regression. I just tried the proposed kernel (4.15.0-18.19) and it still has the same problem. I'd suggest prioritizing testing of the v4.15.17 mainline kernel as this is the latest update bionic has incorporated. If that is broken then try v4.15.18 to see if there's a fix there, otherwise it points to some Ubuntu-specific changes or backports. I've been investigating, and I strongly suspect these commits for bug 1759723 are to blame. Or we can revert those two patches. I'm considering both options, will provide one or two test kernels soon. Here's a test kernel with the reverts, please let us know ASAP whether or not this fixes the issue. Please test the kernel from comment #12 first though, as I'm more inclined to revert the patches for the moment. We may consider adding them back later though with these additional fixes if they are confirmed to resolve these hangs. Thanks! I tried both these kernels, and unfortunately they are both still leading to hangs on my HP ProLiant (from bug #1765105). Make sure you got linux-image-unsigned, linux-modules, *and* linux-modules-extra. linux-modules-extra has the hpsa driver. Seth, thanks for the guidance, that did it. Looks like the kernel from #12 works without issue. Glad you were able to identify the commits that did it. Thanks for testing, I'll get those reverts sent to the list. The kernel from post #12 also works without issue for me too. I just did a fresh install of the April 24 daily build with kernel 4.15.0-19 on my Dell R820 and I can confirm this has been fix. Thank you!